Welcome to the third in our series of discussions on revitalizing the social sector. We have an interesting panel this morning, and I am in an exceptionally fine mood as the sun is shining brilliantly here in Victoria (after flying into BC last Thursday from Ottawa's snow and freezing drizzle). I am pleased to inform you that our climate action report from 60 + 10 Canadian scientists was just featured in the Guardian, http://www.theguardian.com/environment/climate-consensus-97-per-cent/2015/apr/15/65-canadian-scholars-draw-up-a-roadmap-to-curb-global-warming?CMP=share_btn_fb. Please send to all of your networks, we are trying to gather as much support as possible to inform the upcoming federal election. When we begin at a.m. PST, 1:00 p.m. EST, could you please briefly introduce yourself and tell me why you think the social sector is so important, can't the private sector do it all, as some organizations claim? My name is Cheryl Rose and I'm an Associate at the Waterloo Institute for Social Innovation and Resilience at the University of Waterloo where I've held a role as one of the partners in the national Social Innovation Generation (SiG) initiative for the last 8 years. I'm also a Senior Fellow at the McConnell Foundation this year and most recently have joined the faculty team at The Banff Centre as part of the upcoming Social Innovation Residency, launching in June. Let me stop there for a moment to hear from some of the other panelists before I try to answer the question around the importance of the social sector - a big question! Peggy Taillon from www.ccsd.ca and heramission.org in Ottawa. A healthy democracy is strongest when they have an active citizenry, engaged and modern public institutions, vibrant business sectors and a dynamic civil society that will at times collaborate other times push back but all contribute to local action that can be scaled up to sound national policy and build strong nations. Each contributes and shapes local, regional and national space and ultimately defines the character of a nation. I agree with Peggy's description about importance of an engaged citizenry - that does not necessarily equate with the non-profit sector though. It might be important to tease out what we mean by social sector. Agreed Al, there are approximately 160,000 not for profits in Canada. This includes everything from hospitals to local neighbourhood focused organizations led by volunteers. It's a diverse array of players hardly homogenous and all making considerable impacts at many levels in the country. Hi Ann. By way of introduction I am Mary Herbert-Copley. I have worked on building sustainable communities for most of my career, both in the federal government and in the non-profit sector. For the last several years my focus has been on solving problems using a deliberative design approach, and have been engaged in both teaching and applying user-centric co-creation processes to address challenges in our public and social spaces. As Knowledge Curator for Changing the Conversation, I am currently focused on developing an innovative multi-media space to engage the 18-30 cohort, seen to be on the political periphery, but who when engaged can and should make an enormous difference. Hello everyone, Katherine here from CCSD. Sorry to be late. I am wrestling with my computer today. I am in need of some technological innovation - in addition to social innovation. Will pick up the conversation - looks very interesting. Welcome, everyone. Any other comments on the importance of the social sector to Canada? In my opinion, the social sector is a vital component of a fair and democratic society, and has been the heart of social and environmental action within our communities. In the UK it is called the third sector, and some are now calling it the “People’s Business”. It empowers individuals and communities to make change, and the places that have an active place based social sector are (in my opinion) stronger and more connected to their citizens. I think one of the big challenges in Canada is getting the other two sectors (government and business) to acknowledge the economic, social, environmental and cultural contributions of this critical partner, and then collaborate and share assets so together they can address our many complex public and social problems. Well, for better or worse, I think our social sector continues to be a home for our moral conscience and our collective sense of justice. It upholds and acts on many of our long-standing values that we associate with "being Canadian". Traditional thinking says that the social sector is responsible to some of our most vulnerable - while the private sector, by its very structures and definition, is ultimately responsible to shareholders for financial returns. The question that I think about is how we can break out of those strict paradigms for some true integration that doesn't necessarily mean significant loss of social, environmental, or economic well-being? I hope that the time for more radical exploration of those kinds of questions is upon us. Let's move to our first question, shall we? Okay, so you have convinced me that the social sector is important to Canada-- economically, socially and to the quality of its environment. Social innovation is also critically important in today's turbulent world of what many refer to as complex wicked problems. 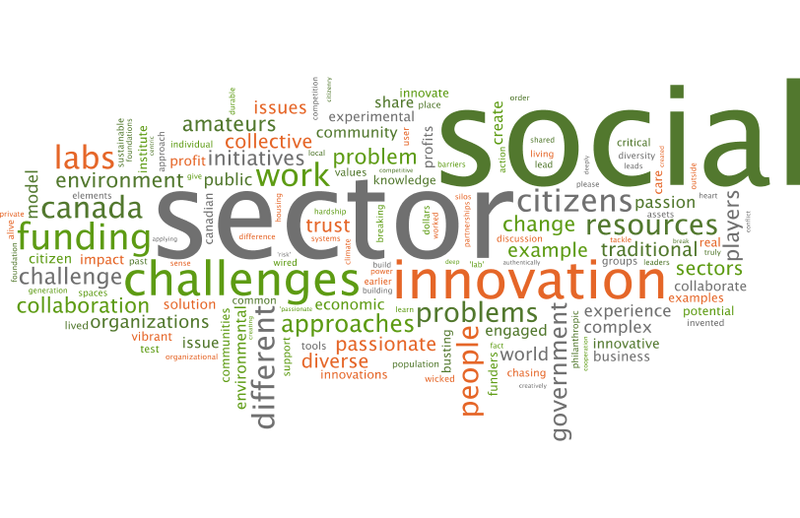 What are some of the issues facing the social sector? For me, social innovation generally refers to new approaches to deal with our health and wellbeing. The “wickeds” include how we treat our aboriginal population, our seniors, those with disabilities, our fellow citizens who are low income. It includes the environment in which we are living – the GHG emissions, the new climate patterns we are causing, the poor development of our urban spaces that causes problems, etc. The issues themselves are well known. I think the challenge for our social sector is not the WHAT but the HOW they will address these issues. No one actor can go it alone any longer any longer. The issues are too complex and interconnected. I believe the shift most needed is to find a new model of collaboration so all sectors can work together and tap all assets needed for create and scale the needed durable innovations. I do not think the social sector has a choice. The traditional funding model is changing and many would argue is broken. Too many chasing the same donor pool, in which there is both inundation and fatigue, as well as a desire to be more relevant, especially in the younger donors coming online. And once there is agreement on collaboration, the next challenge is pivoting from a “we are the experts” to “we are the facilitators”. Problem solving in the public and social spaces demands we all become much more sensitive to the USERS needs – those who are most affected by the problem and who will also be most affected by the solution. Without understanding their needs and desires I believe ensures failure at the other end, since they ultimately control whether the outcomes are successful or not. For example, if you build social housing counter to what the tenants want and need, there will be high levels of vandalism, indifference to the property and its contents, and a failure to achieve a needed sense of community required for safety and well-being. Encouraged or even forced to 'collaborate' in an environment that has been set up, in fact, to be highly competitive for resources, community organizations are challenged to live with these extreme tensions. I recently was at a gathering of social sector leaders where Bruce MacDonald from Imagine Canada, in response to a similar question, stood up and brought up the issue of TRUST. He tried to make the point that he saw no way forward in meeting the challenges that the sector's organizations face individually and collectively, without first addressing the lack of trust between organizations. I'm curious about what others think about that statement. Hi Cheryl - I completely agree - since leaving government I have had the opportunity to work in a few social sector orgs and you are right. Sadly the traditional model still in play is competitive and I think largely driven by funding. All are chasing a shrinking funding pool and also often chasing the same volunteers. Many orgs have same or similar mandates which create further tensions and even greater competition. So trust is low in a sector that embraces values or respect, equity, and the collective over the individual. Where I have seen great cooperation is when communities hit a really wicked problem and all players come to the realization that any movement towards a solution will demand collaboration and sublimating self. We need to see more of "we are all in this together" rather than my way is better than yours. There are significant challenges facing the sector. Shifts away from core to project based funding has created a rationing environment and despite the best intentions to collaborate, it has created a divide and conquer atmosphere in some instances. There has also been an increased account. Ability regime that has created hoops, mazes and barriers for organizations to navigate that can create problems for organizations with few resources or paid staff. And let me be clear the sector embraces accountability but layers of red tape in the name of it serves no one. I also wonder how much Canadians understand about the sector, the economic impact, the many contributions, the fact that in many instances charities are doing what large government departments used to do. The non-profit sector has become more and more reliant on government dollars over the past several decades. Those dollars restrict its ability to innovate. This happens for a variety of reasons which I could elaborate on. My main point is that non-profit service providers have little or no flexibility and resources to pursue innovative solutions because the funders want predictability. On the other hand, in my experience most social innovations I am aware of come from a class of citizens I call 'passionate amateurs.' They are the people who are faced with an immediate challenge - someone or something they care deeply about is vulnerable, in pain, in hardship... They innovate because they must. They innovate beyond job descriptions, office hours and w/o many resources. If necessity is the mother of invention. Then love/caring is the other parent. Any serious discussion about citizens and social innovation should take this group of people into consideration. They inhabit the sacred headwaters of social innovation. Love this framing Al. It goes back to people, who care about something, are driven to action, who inform themselves, get engaged and motivate others to join them. It is multiple small acts, the little things that shape commutes along with the bigger more visible pieces. I agree with Al and would like to say more about passion. I see a challenge in the social sector around the dilution or dismissal of the real passion that individuals feel. Some passionate amateurs moved in to organizational homes because of their passion only to find it sort of beat out of them many times. This is a quote that I often reflect upon from the book “Getting to Maybe” - it's a reflection on the critical importance of passion even though as a society we have drifted towards giving it little attention. How can we keep passion alive in the sector organizations and within sector leaders, in addition to those Al describes as "passionate amateurs"? "When sector leaders are asked to recall and express what originally brought them to their work, it was because they cared, and cared deeply, and wanted to make a difference. Part of their challenge (in creating conditions for real innovation in social systems) is to find the courage to articulate the vision that can rekindle the flame. Effective and innovative organizations keep alive that vision and passion, that sense of calling." Al, I agree with your "passionate amateurs" - they are the heart of the social sector, and will often be the ones who will speak most authentically to the problem being addressed and most creatively about potential and durable solutions. I believe that to keep passion alive, one has to feel that they can make a difference, how do you ensure that these key players do not burn out, Al and Cheryl? Great and important question - and one that is beginning to get some attention. There are some initiatives getting seeded that are looking at what I usually call "encouragement" - I've thought about this for a quite a while now as a missing piece in our efforts for change. I think there might be a variety of ways to go about this - connecting those with passions for change together for peer support; resourcing time for reflection and meaning-making (Funders need to begin seeing this as important for impact); facilitating in practical ways more opportunities for learning. My original citizen 'home' is in the disability movement particularly families. While they can 'burn out' in the sense of coping with daily (sometimes insurmountable) challenges with limited resources - THE CARRY ON. And that's the point when someone or something you love is facing hardship you keep going regardless. We have significant examples in Canada of people carrying on, being ingenious etc. regardless. Often the biggest challenge faced by citizens and passionate amateurs is the hegemony of the service delivery system. For example 80% of the care in Canada is provided freely, lovingly, voluntarily by family friend’s neighbours and co-workers. Yet almost 100% of the resources and policy discussion is devoted to 20% of care that is paid/professional. Notwithstanding the fact that the professional system could not do what it does w/o natural care. Al, thank you, I had never thought that framing the issue as 'burn out' may actually be a way of disempowering volunteering, and its co-benefits, for example, there was a recent article that said if you volunteered you were happier and lived longer. The framing of the issue is so very critical. I agree trust is fundamental, and it's much harder to do with authenticity than we appreciate. Competition often weaves its way into relationships, particularly in a climate of rationing. I am sure you have all been in meetings where all expressed shared values and vision and promise to work together but then ownership and money cloud those great intentions. I often feel that shared problems, rolling up sleeves together can unify and build trust. We do it together, we get tested together, and we share the risk and reward. Peggy, you have long been a leader in the social sector, so greater collaboration between organizations. Is there a new role that foundations could play that would help the sector work more collaboratively? Absolutely Ann. We can see some philanthropics moving to fund only initiatives that are locally led in partnership with multiple players with solid participation from people with lived experience shaping and guiding outcomes. A foundation partnering with a mix of not for profits, citizen groups, people with lived experience or the targeted population, government and business for any initiate they are fusing or launching. So all hand on deck to problem solves, shape a solution and collaborate. The not for profits ideally should be those they haven't worked with in the past in order to test out new approaches and create new partnerships. I agree, Peggy. And then also different funding partners collaborating together on specific issue areas. These kinds of collaborations that lift the funders out of their organizational 'homes' to view the challenge from a collective viewpoint holds some real potential for innovation. Especially because they can share the 'risk' associated with funding initiatives that are more experimental and new. I hear the need for collaboration very clearly and Cheryl raised the first step in collaboration, that is, trust. And how do we engage the 'passionate amateurs'. This last point is very important as the baby boomer generation ages and is a potential vibrant place for a new kind of volunteer, but they need to 'see their place' in this opportunity. How do we stimulate greater collaboration, what is needed? Recently, I've heard some interesting conversations within the sector that have questioned the whole idea of a separate sector for social good. I think that's an interesting question! In some ways the 'we're all in this together' or "there is no them and us" approach begs this kind of question. Labs, collective impact initiatives, etc are steps in that direction, but what about a total re-imagining that asks people and orgs and businesses and government departments that can attract around a question or an issue - what about if the challenges became the 'sectors' rather than our traditional definitions of private, public, social sector and citizens? What innovation do you know of that the sector is adopting to meet the challenges? Mary, could you please bring your 'lab' experiences here? What new models are there and how are they working? I think many social non-profits are now recognizing the need for a different model, and some have successfully applied new approaches. The Housing First model is a great example at a user centric approach to end homelessness. Vibrant Communities is another led by Tamarack and is focused on poverty reduction through community partnerships and levering existing assets. McConnell is a leader in Canada’s philanthropic community funding many programs that address complex social, environmental and economic challenges. Cheryl and Al can tell us about SiG. We have a growing number of homegrown experimental and innovative initiatives now. Personally I think Europe leads in this area. NESTA is doing amazing innovative work in the UK, and ENOLL now has a network of over 350 living labs worldwide. All this funded experimentation is leading to impressive successes – and lots of failures – that if treated properly can iterate toward success. I think Canada can learn a lot from these outside labs, projects etc. The key for me is to strategically use and share ALL the knowledge openly to allow others to learn from it. This liberal sharing should lead to deeper and broader knowledge mobilization and accelerate innovation – which we dearly need. But….we still need (and lack) a funding model. In Europe, public funding drives much of the social innovation. Same for many of the spaces in Australia and Asia. In the US, large philanthropic entities have heavily invested in these new experimental approaches, as well as many of their big corporate giants (the new disruptive approaches for both economic and social change are the lifeblood of Silicon Valley). In Canada we again suffer from a small population of donors, philanthropic and individual. Hi Mary, I'm inclined to say that social innovation is alive and well in Canada. I doubt that any jurisdiction leads. Lack of public sector support in Canada may well be an advantage in the long run. Initiatives elsewhere, although perhaps better funded, are not necessarily making long term impact. The grass always seems greener elsewhere. I'm watching and studying Canadian initiatives and they stand up well to what is happening elsewhere. I see foundation, public sector, grass roots, social enterprise and non-profit initiatives that are as breath taking in their boldness, scope and practicality as anywhere. I think we get seduced by new technologies from elsewhere which may or may not prove useful in the long term. I agree with Mary - that there is tremendous community innovation taking place around the world - in spaces that deliberately set aside institutional barriers and try to tackle the issue from the perspective of the user/client/citizen. As everyone has noted, this work flies in the face of the institutions that we have collectively built to manage our collective affairs. Earlier we were talking about the competition in the social sector, particularly around funding, but a part of this stems from the roles we have been assigned. Governments, for instance, decide to get out of the social housing business. Social organizations already active in the community move to fill in the gaps without the necessary resources. The private sector could play a huge role in generating affordable quality housing, but there may not be enough money involved to incent participation. What I am getting at is that if we are to bring down the barriers between sectors - to foster social, economic and environmental innovation - we need to tackle the thorny issue of power and who is driving change - for whose benefit. To Cheryl's comments, social good or national good is a great way to bring players together and do a little sector busting, rather than perpetuating traditional lines/roles of government, business and not for profit. I agree with Peggy - diversity is critical if we want sustainable and scalable solutions. All key players are needed to co-create sustainable and scalable solutions - users, funders, decision-makers, etc. And it is really important to tap assets not traditionally tapped - we have a tendency to go back to same players as a way to manage risk but by doing so we may be missing out on truly transformative possibilities. To continue on this thought, diverse stakeholders are important for sure - including unusual suspects. I am also a firm believer in scoping out very concrete challenges. Breaking down our very large problems is key to generating sustainable action. It is hard to get away from the feeling that our challenges are overwhelming. We need to take people's tendency to hone in on something they can achieve, and run with that. It is no surprise to me that social labs - as one example - are taking root in cities, working on the concrete challenges that our ever growing urban environments generate. I wonder if we could push Cheryl's question a little farther, given the vast experience of this panel. I wanted to respond to Rob's point and examples. Great point put forward by Al on ’passionate amateurs’. It reminds me of the work done by Tarah Stafford on Eagle Island, organizing the community in retrofitting efforts (http://mc-3.ca/eagle-island). The ‘by the community for the community’ approach really speaks volumes about local agency. Too often we focus on new techniques, technologies, methods when they are simply tools. Tools which will be used well when in the hands of citizens. Al, too often we forget our history and many of the 'older' organizations that have been working for a long time. The funding world has changed tremendously though, I was part of government when we had policies in place for equitable distribution of resources and for building a vibrant social sector, i don't think our current environment has those values. I wonder if there is a way that groups in the sector could collaborate together on collective funding proposals strategically over a two-year period to submit to the key foundations to test their capacity for Peggy's solution. This would take first, unprecedented trust, cooperation and collaboration and who could lead this? Am I dreaming? Ann, to be a little provocative here are three observations. When policies for equitable distribution were in place they did not always lead to a more engaged, informed citizenry. Those resources were often acquired by groups who preserved the hegemony of the status quo. The grass roots, citizen led passionate amateur initiatives I am familiar with, originated and evolved with no or minimal government support. Eventually they migrated to non-profit government and sometimes business sectors. Mobilizing of our collective economic power in tandem with the moral authority of citizen sector is critical to refreshing our democracy and creating the conditions for proven solutions to spread. Seems to me that might be a more appropriate time to engage government. And we have such great Canadian examples of this. As for government vacating its traditional funding role I agree those who survive may be stronger and more relevant - but I do think all sectors need to collectively discuss how to collaborate better in the future. I think place and space is incredibly important for innovation. Institutionalizing this has some real advantages. It creates a petri dish of activity and people and ideas riff off each other and create new and unexpected problems and solutions. People and organizations are attracted to the buzz and come out of curiosity and stay they see how it can help them problem solve. I think the formalized is really good when focused on social entrepreneurship, and or when the mandate is broad demand driven problem solving. But I do not think hard wired is the only way and issue specific community problem solving can be accomplished and perhaps even better accomplished in a more ad hoc manner and in place and space that belongs to the appropriate community and or issue (although neutrality is important if there are tensions in the co-creation). So I think my answer is both have advantages and can produce different outcomes. I do think the formal approach can have enormous payoff if treated as experimental and disruptive and if it has sufficient buying and funding. Whereas the other "mobile" approach is less costly, agile and more realistic for majority of community problems. My last point would be regardless of where or how that the knowledge created by recorded and shared as it is the knowledge that is key for future and iterative innovation. Interesting emergent innovation from our discussion--what about sector busting and I would assume that leads to breaking down organizational silos within the social sector? Our challenge in this is applying what we know and what we think we know and want to test in an environment that is wired in traditional siloes, structures, regulatory environments that are often counter intuitive to addressing the issues. I have received calls and worked with truly enthusiastic and engaged citizens who wanted to address challenges in their local community only to get stymied by process, layers of red tape, process etc.... It can be demoralizing. Sector busting, deep collaboration, new focus on challenges rather than sectors - all these kinds of ideas circle back to building real trust, rekindling individual passion, and new lenses on 'risk' and 'failure' - could it be that these aspects of deep culture shifting within and about the social sector are the starting points? It seems that these elements are usually swept under the rug - is it time to put them right out on the table and try to address them? Exactly and the systems perpetuate it, because the model works for the provider not the one needing the support of their family. There is a lot of rhetoric about client centred, person centred user centric....but it often plays out as tokenism. The other challenge is that we are often applying better approaches in poorly wired systems so change is not realized. I agree with Peggy. Our traditional systems are not wired for social innovation - and it is much easier to envision new solutions outside of the confining walls of a multinational or government department. That said, how do you turn these supertankers??? This truly is a problem in need of social innovation - because it is hard to imagine realizing the potential of change without moving to democratize workplaces, government agencies, and the like. This comes back to the scaling up question. Here is an interesting observation from our e-audience. The points on diversity tie in well with Cheryl’s earlier question on organizing around challenges and this latest question on breaking silos. Diverse minds/talents to tackle complex problems. Of course, operating in a diverse environment also poses the problems of how to handle internal conflict and disagreement. I see some excellent lab-type approaches incorporating elements that focus very specifically on creating an attitude of welcoming inevitable conflicts as signs of rich diversity in the room. But aside from that 'rosey' lens, of course the fact is that diverse groups of people preparing for significant change of some sort or going to experience very human emotion around fear, discomfort and uncertainty. These are not allowed! - or so says the culture we've been a part of creating that insists that we confidently always know for sure. It's ridiculous and no one can live up to that - if we're comfortable all the time, we're not getting anywhere close to something new. To me this is another thing to more explicitly acknowledge and then plan for the supports required for passionate people to work together for real change. It's very hard work. I believe in testing out solutions, piloting on the ground with all hands on deck --- the usual and unusual suspects. Really world let's give it a shot and see where we land. I have written so many policy pieces, reform documents in health and social services. They rarely get uptake. We are a country that has studied ourselves into a standstill. For the most part we know what the issues are and we know what's in the tool kit to address them, we also have diverse expertise at all levels to work together to get things done. We need flexible of pilot $$$ to test out good ideas, evaluate, tweak and scale them. I guess we should move on to our next question. Are there new models of collaboration, coming together, of communicating and reaching the Canadian publics about the work and importance of the social sector? I am cognizant of Al's earlier points here, that the sector is more vibrant, and doing far more innovation than is generally thought, but I know that many social sector leaders work too hard chasing fewer and fewer dollars. Another thought, let's turn the cake upside down, instead of foundations deciding the issues and then funding them, how about a collaborative approach--the sector decides the challenges? I don't think the sector alone should decide the challenges - I think the real upside down would be for civil society/the users to determine the problems - and better would be a collective collaborative effort - a co-created triaging of priorities/challenges. In our village in Kenya, there are few labels, no resources except what our lears hips group of ladies pull together. If someone needs more help than others today, they are the focus of the collective action. So no one is the man living with polio or the women living with schizophrenia, they are Agnes and Omar and some days they need extra help in support. The village pulls together in response. There are many other complex challenges that they have to navigate in order to help them of course but ownership is community based, their problems and solutions are shared. We are isolated, individualist, and competitive in the West. To build on this point of Peggy's, I am struck constantly by the great things my kids get to do at high school. There are fantastic opportunities for young people today to collaborate. Mock parliaments, development projects, and the like. We Day was last week, bringing together kids from across the province. Yet, once we leave the education system, it is harder to convene these type of broad social gatherings dedicated to creating change. I think of the citizen assemblies - or the alternative budget processes that have popped up in all sorts of countries. How do we create these kinds of spaces - and tie them to the lever of government/business/civil society that can effect change? I feel a need to say that collaboration and connection, in and of itself, does not equal the positive change on complex issues. It does ensure that we feel that we're doing 'something' and that we're part of 'something'. But too often we collaborate for its own sake and there is more to it. The question for me is not only 'how' to create these spaces but also the 'why?' What's the purpose? Yes - I completely agree. We can't get caught up in the process without focusing on the objective. The piece that I think is critical is fostering a sense of agency. Too often we feel ineffective. Indeed - this is a tremendous source of illness and stress in our society. But without clear objectives, we won't get anywhere. Communicating to the public is a top priority for the sector. While the medium is important (use of social media to engage the millennials) the content is even more so. Today funders are demanding "proof of change" or impact that has occurred directly from or associated to their gift. E.g., a child now is wearing shoes, a homeless person now has lodging, 50 children were fed in a before school breakfast program, etc. This is why micro fund non-profits like Kiva are so popular. In the case of Kiva, donors know exactly who will receive the loan so they have a human connection and Kiva does not collect any interest on loans made to “field partners” so they are not profiting from the donations. I think social sector organizations need to watch this trend carefully as it means money cannot be taken any longer with a “just trust us to make the right decisions on your behalf” and yes we will be taking a percentage to pay for our salaries. So again traditional models need to be rethought and reframed. And I think that is a good thing because one likely outcome will be more collaboration, and a retuning of mandates within the sector. What does everyone mean by a 'lab'--give me your definitions? I'd say there are different definitions of labs because there is no one type. Different lab processes address different kinds of questions in different contexts and for different purposes. Labs have some common elements - an experimental nature looking to discover together something 'new', diverse collection of participants around a common purpose. Here's a link to a page with various resources on labs, including a short doc on defining different lab approaches. But as Al has already mentioned, we need to be careful to remember that things like labs, social finance, social media, collective impact, etc etc are tools - they are not guarantees for meeting the social and environmental challenges we face as communities. It still comes down to us - we human individuals - and our capacities to adapt and change ourselves and the ways we live and work in the world with others. To build a little on Al's comments, what lessons can be learnt from past successes, key innovations and strategies, even in today's modern context of wicked, complicated, intergenerational and spatial justice challenges? You guys have really opened up my assumptions about the sector? Hi Ann - this is an important and may I say spiritual/philosophical question. Every generation thinks they are facing the direst set of challenges ever. Read Barbara Tuchman's book - A Distant Mirror. Folks of that era must have thought the world was coming to an end. The opportunity of social innovation is not for its tools, techniques and technologies as much as for approaching our work together with an open heart. There is no tool that can do that. Neither can the intellect. Simone Weill once said - the intellect is enhanced by love. Our journey is from hubris to humility. To me that means admitting we don't know as much as we think about change - that we are as guilty of 'willful blindness' as anyone. It means wondering what we can do to 'resurrect the ordinary.' And sadly I think it means doing things because they are the right thing to do even if we are running out of time. The seduction of technology is that it can speed our solutions. Working with an open heart is soul work and it takes time. Rob makes a key point about bringing various sectors together around specific challenges. I agree. The Canadian led G-20 Changemaker contest which mobilized half a billion for SME to address poverty in developing countries. All of these involved all three sectors and all are happening right now and all are specific. Things aren't as bad as they seem. And yes, mistrust, conflict and disagreement are part of all of these. Yet folks found a way to work through them. Thanks, Chris, for the word cloud. Clearly, from our discussion we need to move to sector busting given how much that one word has dominated this conversation. What a rich dialogue everyone, such wonderful perspectives, Al reminded us of the self-organizing strengths of grass roots movements, and the many successes which points out how critical the language we use how the issue is framed is. We do work, however, in a more complicated world today, however, these kinds of conversations and evidence-based dialogues are crucial to re-imaging the solutions. Some stimulating questions, thanks Rob Newell, what if the challenges became the 'sectors' rather than the traditional definitions of private, public, social sector and governments? What if the social sector identified the issues and co-created funding opportunities with Canadian foundations? We must continue this conversation, any last comments? Thanks everyone. Wonderful insights and great leadership. And yes we need to keep it going. These are very important conversations that we need to commit to broadening and deepening. To refer back to my intro, and in response to Al's beautiful comment, there is something about these conversations about our own social sector that is so much about ourselves and our values. We have much to learn and re-discover about both. Many thanks to everyone on the panel and to our audience members and to Ann for inviting us all to spend some time 'typing' with each other :) I've really enjoyed it. And to finish - the one thing I find inspiring about the social sector - those passionate amateurs - is that they persist in hope. It is a powerful force indeed. It is always an honour to have colleagues dare to experiment with my attempts at making the internet a force of light rather than a force of darkness. I think these kinds of virtual real-time conversations will become an important way for people to connect as they age, to continue to still be engaged intellectually. The transaction costs of traveling are becoming greater and greater, especially air travel, take care, I am now going for a walk in the sun. Thank you, merci. One last thing, here is a link to an interesting book, all Canadian examples, and focused on the challenges of our social sector.